Human ACAN / Aggrecan. BLAST analysis of the peptide immunogen showed no homology with other human proteins, except NCAN (56%). Synthetic 18 amino acid peptide from N-terminus of human ACAN / Aggrecan. Percent identity with other species by BLAST analysis: Human, Gorilla, Monkey, Marmoset, Hamster, Pig (100%); Mouse, Rat, Bovine, Panda, Horse (94%); Dog, Elephant (89%); Bat (83%). Aggrecan antibody was raised against synthetic 18 amino acid peptide from N-terminus of human ACAN / Aggrecan. Percent identity with other species by BLAST analysis: Human, Gorilla, Monkey, Marmoset, Hamster, Pig (100%); Mouse, Rat, Bovine, Panda, Horse (94%); Dog, Elephant (89%); Bat (83%). Small volumes of anti-ACAN antibody vial(s) may occasionally become entrapped in the seal of the product vial during shipment and storage. If necessary, briefly centrifuge the vial on a tabletop centrifuge to dislodge any liquid in the container`s cap. Certain products may require to ship with dry ice and additional dry ice fee may apply. Aggrecan Core Protein, ESTs have been isolated from lung, uterus, brain, colon, bone, adrenal, stomach, breast, liver/spleen, fetal lung, fetal testis, and fetal B-cell libraries. 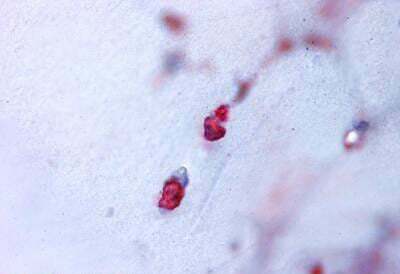 Anti-ACAN / Aggrecan antibody IHC of human bone, cartilage. Immunohistochemistry of formalin-fixed, paraffin-embedded tissue after heat-induced antigen retrieval. 1. Data show there was no significant difference in the aggrecan (ACAN) rs1516797 genotype or allele distributions between the carpal tunnel syndrome (CTS) and control groups.